Will Ash Williams ever find true love on 'Ash vs. Evil Dead'? 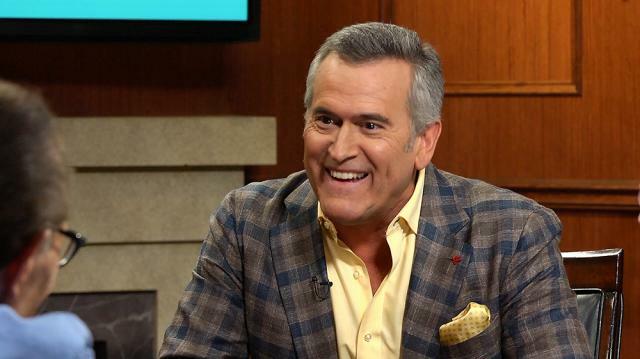 Iconic 'Evil Dead' star Bruce Campbell discusses his character Ash Williams' love life with Larry King, weighing in on whether or Mr. Williams will ever find that special someone. How long will 'Ash vs. Evil Dead' last? Larry King: @kat_astrophe101 on Twitter: Will Ash forever be the quintessential bachelor, or will we see a love interest in his future? Bruce Campbell: Uh, never say never. Even dysfunctional idiots can get girlfriends. We know that from life. So, I think he will. But, if people get too close to Ash, they don't, they don't last that long. Like, you want Ash in your foxhole during World War II, but only for a little bit, then you gotta get out of there. Because you will get killed.